Ballinacorbeg is the 1078th highest place in Ireland. Green fields and great views. One way to reach this is from the SW climbing mostly in a forest and starting at T1780 9906 A. Proceed until the third turn to the right T176 994 B and break out of the forest to the west. (If there are animals in the fields we recommend you continue on the track to the east side of the forest.) Head across the fields to the summit which has a trig pillar. Another way of reaching the summit starts at Derrylossary Church Yard where there is very limited parking at around O1834 0133 C. We would recommend asking permission for this route before starting. Surprisingly the summit fields are in very good condition for such a high altitude and actively used for sheep farming, so cross with care not to annoy the animals particularly in spring. Dogs are out of the question. We met a farmer, explained what we were doing and he was ok with it, but we would not assume that visitors would always be welcome. Pleasantly surprised by this, could clearly see Lugnaquilla and Croaghanmoira, as well as numerous other summits, slightly awkward entry into the fields just west of the forest which don't appear to be currently used for grazing and are being overtaken by gorse. Landowner appears to have placed a huge drum of water in the main clearing, perhaps to ward off trespassers, so some investigation needed to exit onto fields but simple passage thereafter. Met nobody to enquire about access. Sheep grazing around the trig pillar. Great views, allow c1hr round trip. 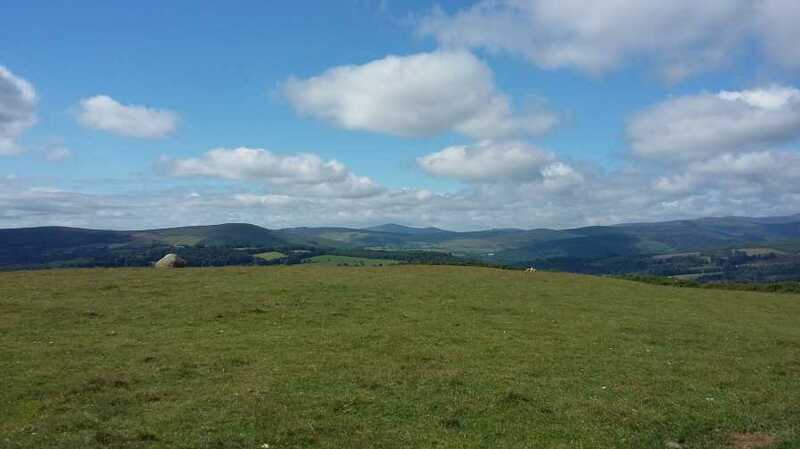 Picture from simon3 : The Great Sugar Loaf and the Trig Pillar. 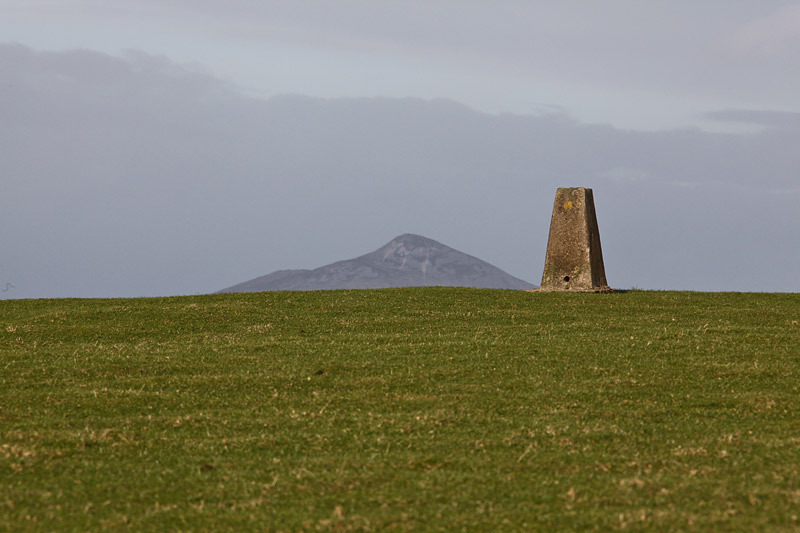 Picture: The Great Sugar Loaf and the Trig Pillar. Green slopes in the morning, snappers delight. 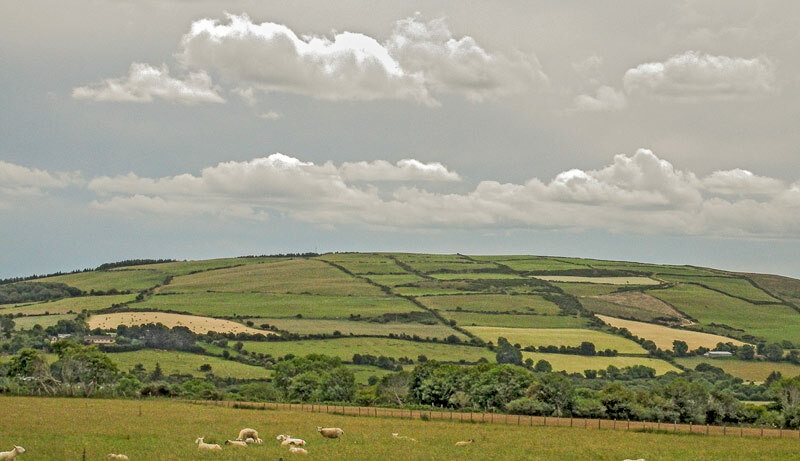 The top of this hill with its sheep cropped grass and gentle rounded slope has great potential for uncluttered middle distance photography. Further out there are views of Scarr and particularly a different angle on Knocknacloghoge.